PLEASE NOTE WE ARE CURRENTLY UPDATING OUR 2019 PRICING so we have blocked some dates, and anything past January will be wrong, so please check with us and we hope to have this up in the next few days. Thank you for your patience. Just about 1/2 a mile on foot (or a minute by car) you find yourself at Trebarwith Strand beach, recognised as one of the best beaches in Cornwall, not just North Cornwall. In 2014 it received the 'Good Beach Guide' Recommendation for Excellent water quality. Additionally, it is one of the few beaches that is dog-friendly year round. PLEASE NOTE TUESDAY AM is RUBBISH COLLECTION, SO YOU MUST TAKE THE BIN OUT OF THE CABINET AND PUT IT ON THE ROAD RIGHT IN FRONT OF IT ON MONDAY NIGHTS. THIS IS MANDATORY! If our cleaners advise they have arrived to find a full bin, then you may be charged £50 to recoup our fine from the council and the extra cost from the cleaners to deal with this. Sorry to type in caps, but this is getting ignored, and either kind guests are taking rubbish to the tips, or the cleaners do and charge us more. (Ref 3808464 with council). As Treknow is a small quiet hamlet just over a mile from Tintagel, with no shops, cars may easily be parked on the road outside the house where there are no restrictions. From the house, it is an 8-10 minute walk down to the beach, via either the Coast Path or just 1 minute down the road, which is excellent for swimming and surfing. If you have little ones, we suggest taking the car down, and parking in the car parks provided at Trebarwith Strand, as the path isn't flat, and the roads are narrow (single track with passing places)! It’s also an amazing place for walking, or just lazing about and reading or having a picnic. For those who enjoy nature beyond the beach, bird watching along the cliffs is excellent and on nearby Davidstow Moor and Bodmin Moor there are some truly beautiful walks. The house has books and maps with information on both. Puffins consists of the main room, three bedrooms (the main double, a smaller double and a single room; please note the single room is small and there is limited storage in that room) and a full bathroom (tub and power shower). On the terrace, there is a retractable washing line which is a good place to dry anything BUT wetsuits / swimsuits. They are too heavy for the drying line, but putting them on chairs, the fence, etc gives them an excellent place to dry in the bright sun the patio gets. No expense has been spared -- the main two beds are from Loaf and Warren Evans, and all bed linens are from Loaf (www.loaf.com). The furniture throughout is from Loaf, Neptune, French Connection or a few local boutiques, and is to a high standard. After all, Puffins is our retreat from the hustle and bustle of the world too, so we want to feel pampered there as well. If you have 2 children (over the age of 6 or 7 only), one in the single bed in room 3, and one in the double in room 2 works out well. A pretty walk down the hill is a very good pub, The Mill House Inn, with both a pub menu and an excellent restaurant. They also do live music some nights. At the beach is The Port William Inn, called by many ‘the best pub with a view over the sea in Cornwall’. It is a wonderful place to watch the sun going down and serves a wide range of different foods and snacks which are better than standard pub fare. It has both indoor and outdoor seating. Additionally, in the summer the café next to the beach has fantastic homemade food and good coffee, and next to the Seagull Surf Shop they sell freshly made doughnuts. The nearest shops are in Tintagel which is just over one mile away, and then Camelford and Wadebridge if you wish to do a larger shop. Boscastle and Port Isaac are also close, where there are lots of different restaurants, pubs and shops. Rock is about a 20-minute drive away, and you can take the ferry across the Camel Estuary to Padstow from there, which is lovely for a day out. You can go sea-fishing and boating from any of these. In Padstow, you will find Rick Stein’s restaurants and cafés and his famous fish and chips. Rock also has the famous Nathan Outlaw's restaurant. There are bicycles are for hire in Wadebridge so you can cycle along the Camel trail or anywhere you like! Like a bit more activity on your holiday? Then enjoy surfing at Trebarwith Strand or Polzeath, Tennis at Tintagel tennis courts, golf at St Endoc, skateboarding at the Tintagel Playing Fields, kayaking / coasteering / stand up paddling, cycling riding on the Camel Way, or why not even try some horse riding on the Moors? There is so much more to do; the best way to find out about it all and experience it is to come to North Cornwall and stay at Puffins. We look forward to welcoming you! For hot water in the bathroom make sure the wall mounted unit next to the display is on, hit 'boost' 1x for about 1 hour hot water or 2x for about 2 hours. Hitting boost 3 times cancels the request. Ensure the power is on & we suggest hitting boost 1x at night so you have more hot water in the morning & it is cheaper to do it then. **Saturday changeover. Usually, only one dog allowed, enquire if more than one dog. Hi, we are Kristine & Simon, the rather lucky owners of Puffins. We are beach lovers (obviously) and love to come to Puffins to relax, explore and recharge. Even after many years of coming to Cornwall, we are still always finding new things to see and do. Whether it is winter or summer, Puffins is our perfect place. We hope you will find it as lovely and special as we do. Good question! We live in a lovely older property most of the time, but were taken with the amazing architecture of Puffins, and the location, which we think is the best in the world. After many years of coming to North Cornwall for our own holidays, we decided to buy a little place that not only we could enjoy, but hopefully others as much as us. The house is filled with everything you need to feel at home, from a fully stocked kitchen, to books, games, and lots of local information to help you make the most of your stay. The architecture and light of Puffins is so unique to us, but mostly we love North Cornwall. And Treknow is a lovely little village with a small pub, the South West Coast Path, one of the best beaches in Cornwall a 1 minute drive, or 5 minute walk away at Trebarwith Strand, and that is it. But while stores are only a bit more than mile away in Tintagel (and the amazing castle, and some of the best pasties on earth), you truly are in a beautiful, quiet village at Puffins. It isn't as overrun as Polzeath or Rock or Padstow, but all are close by, and this beach is a true find - the locals like to keep it to themselves! Perfect for sitting & relaxing, or taking some surf lessons, Treknow is ideally located in North Cornwall. And the historic village of Port Issac is about 6 miles away, a beautiful drive the whole way there. However, with everything so close, you can be as active as you want, or as lazy as you desire, but no matter what you wish to be you are no more than 20 minutes from everywhere delightful in North Cornwall! Two night storage heaters are in the property, one in the large main room, & one in the master bedroom. They also have instant convection available. Bed 2 has an electric radiator, & the hall does. Linens are included in the rental rate, and are of high quality. We have a washing machine, and then a fold away Brabantia drying line on the patio / terrace that clothes can dry on. **NOTE: Towels for beach must be provided by the visitors. ** Our towels are for use for showering, and not to be used on dogs! Initial cord of wood and kindling provided in rental rate. Fully kitted out with Blu-Ray player, DVDs, games, puzzles, wifi, radio/iPod docking, television with satellite stations. Puffins is fully stocked with cooking pots & pans, baking pans, and other cooking utensils, knives, etc. There is a full set of serving dishes from John Lewis, including serving bowls and platters. The dining table can expand to allow for lots of space while eating, but easily sits 4. You View, with BBC iPlayer and Netflix available on it. Lots of books and maps on the local area, as well as fiction and non-fiction books should you need a good holiday read. Many board games, packs of cards, and puzzles are available. We keep a full array of films and TV box sets on hand, with everything from some children's films to many films and sets for adults. We recommend Cornish Coastal Holidays, they do several different types and lengths of trips. With seating for 6 and a chimenea to sit outside with a small fire on lovely cool Cornwall nights. There are many golf courses around us, so you are really spoilt for choice! As there are steps from the road up to Puffins, the house isn't accessible for wheelchairs. The house is on one floor, with the exception of a step up from the large main room to the hallway that the bedrooms and bathroom are off of. The patio area is perfect to be enjoyed on beautiful sunny days or for grilling in the evenings. The beautiful modern architecture is bright with high ceilings and skylights, so you can see the lovely colours of the Cornish sky or all the stars at night. Puffins has won awards from the Royal Institute Of British Architects. 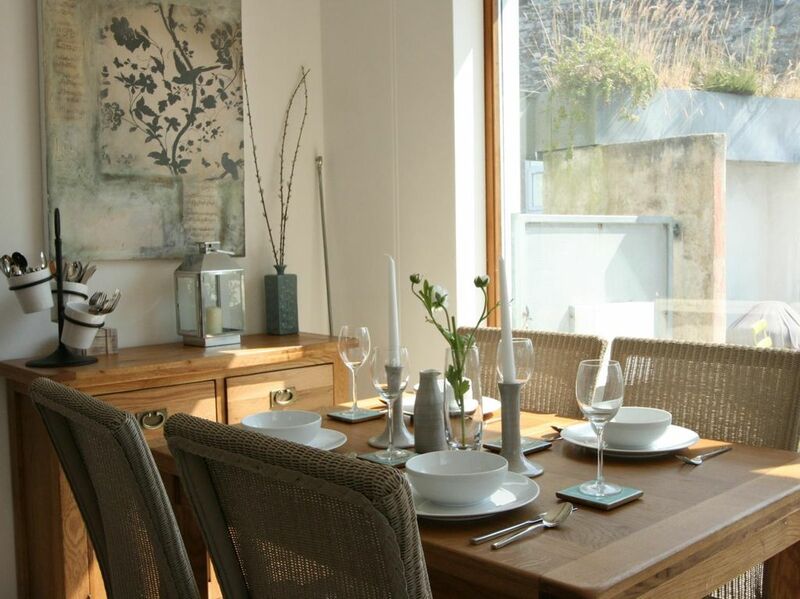 This beautiful home is in the most wonderful location for exploring North Cornwall. Equally as handy for the costal path which gives you access to the beach at Trebarwith with it's pub 'The Port William' via a walk downhill or to Tintagel Castle in the other direction across the neighbouring cliffs (not for the feint-hearted, take your walking boots and torch). The house itself is well equipped with good quality everything and is absolutely spotless!! Gorgeous, linen, towels and kitchen accessories to name a few. We had the most wonderful weekend with our two teenage boys and dog and would highly recommend staying here to anyone. Thank you Kristine for allowing to spend time in your beautiful little house, we are coming back!!! Thanks Michelle - we are blushing! And, you are officially our first 2020 booking - we love having return guests. For those who don’t want the coast path to Tintagel you can go via road on pavement & still get to the church or the castle & there are multiple paths to the beach, or 1 minute by car. Thanks for the review-it not only helps us, but other potential guests decide if a property has what they are looking for, so we really appreciate you taking the time to review-and to book again next year for even longer! We look forward to hosting you again next year. The house is more beautiful inside - photos don’t do it justice. We walked to the beach in 10 mins (and longer home, as you climb uphill), went on the Southwest Coast path & walked along a sea that was beautiful & everyone was so friendly. We’ll be back for a longer stay next year! The cottage is cosy, log burner a lovely feature. Beds are very comfortable and linen high quality. Very clean property and attractively decorated. Beautiful property in a fantastic location - would def recommend. The property was perfect for our needs. Interesting design, wonderfully equipped, very clean and a comfortable. Easy access to nearby Tintagel, Coastal walks and beaches. A fantastic location to also use as a base for exploring northern Cornwall. We only wish we had booked to stay longer. We would definitely return. I also had a quick question about the boiler upon arrival, which i messaged about through the booking site, and not only did I receive a very quick response from the owners but I got all sorts of insights into local places to visit and eat which came in very handy. Thank you for the review - it helps all of us who like to have self-catering properties decide where to stay! We'd love to have you back, and return guests get a bit off, so if you do book remind me in any request. The new kitchen goes in the house in November, so you'll have to see it again! Seriously, I am really pleased the property met your expectations and am truly glad you enjoyed your stay. That is very much a home to us, we use it frequently, so it is nice to know others find it well kitted out and they get what they thought they would be arriving it. A costal retreat full of charm and personality perfect for a family getaway. Firstly a big Thank you to Kristine and Simon for sharing their Cornwall Home. It was perfect, just as you described and has provided us with some wonderful family time and memories that will last forever. Puffins was, high quality, well equipped, clean and comfortable. It was the perfect place to eat, relax and recoperate ready for the following day’s adventure. We could have easily stayed for longer. As well as being well rested given the comfortable beds and facilities, we enjoyed playing family board games that we found in the living room and just sitting watching a film on the television. The location we found to be idilic, 5 mins walk from the Cornish costal path, 2mins drive to the beach and just 5 mins drive from Tintagle. There was so much to do that we will definitely be visiting again. The beach, Trebworth Strand, was brilliant for the kids(13,11,8) and being dog friendly meant we could take ours down to the beach as well. Rock pools, caves to explore and rocks to relax on and around. Most importantly for us though was it was a lovely sandy beach when the tide was out, great for body boarding and surfing and safe thanks to the lifeguards. It is essential to be aware of tide times though to exploit the beach fully but it is a place you can spend all day staring at it as it is constantly changing. The amenities around the beach we found were very good too (shop, pub, public toilets) and even better was that we were only a 2 minute drive back to Puffins if we needed too. Given we love walking as a family, exploring the costal paths to the north and south of Tintagle was very easy. Puffins is located ideally for this. A bonus was its proximity to Tintagle castle part of the ledgend of King Authur and Merlin’s cave. Puffin’s really did make some fabulous memories for us. We can’t recommend it highly enough. Thank you. Thank you so much for taking the time to write such a detailed review - your review encapsulates WHY we do rent Puffins out - we want others to have that bit of a haven they can go to and change gears and reconnect with themselves and others, and do as much or as little as they wish. So we can't wait to have you stay again, and on behalf of travellers who use HomeAway, like us too, your review makes it so much easier to know if a house will be suitable for what someone is looking for! A well designed building, Puffins provided all the essentials for a week by the sea. We loved all of the finishing touches the accommodation had to offer. Beautiful linen on the beds, quality furniture, a lovely vintage kitchen sink and a modern bathroom were just some of my favourite things. The outside space was adequate, but not fully dog proof for our terrier. We were concerned about the parking area but the space suggested was absolutely fine, even in the very busy season that we were visiting. The coastal path is very close and walking In the area interesting and varied, the beach is very close and great for surfing and dogs. Fish and chips fantastic from the smugglers at Delabole and the brewery at Tintagel really good for a nice dining experience (open on Friday and Saturday’s). Thank you for taking the time to write a review - and glad you found the house up to standard, and that you found the fish and chips shop - I always forget to mention it as one of us (Kristine) is allergic to seafood. Glad the parking worked for you, and the bathroom makes me smile, as that was our last large project. Next up in September: a new kitchen! Puffins is the perfect base from which you can explore all that North Cornwall has to offer quite easily, or the house that will be your holiday haven, filled with lots of luxurious little touches, and you can spend your days relaxing, going from the house to the stunning beach at Trebarwith Strand, and never needing anything more. It is 2-minute walk to the beautiful South West Coast Path, which is 630 miles long and covering several counties in England. But you can choose to walk only a mile or two on it to see beautiful sunsets, amazing cliffs and natural fauna – and end your walk with a drink at a pub. Lonely Planet has voted it one of the best walks in the world, and it is on your doorstep. We have several books in the house that suggest walks of different lengths and levels of difficult that you are welcome to use during your time at Puffins. Or you could go inland and walk on Bodmin Moor, which has its own unique feel. Standing majestically a few hundred yards out from Trebarwith Strand beach is Gull Rock, which has been photographed and painted thousands of times, but always looks different. The beach is one of the few that is Lifeguarded in Cornwall, and it is done by the RNLI from mid-May until the end of September. It is also dog-friendly year round, and known for its excellent surfing. If you are interested, you can even take surf lessons right on the beach! During high tide, the sea covers the rocks and gully you walk down to reach the beach, but when the tide is out there is a stunning mile of golden sand below. At low tide you can explore the caves – known locally as the Port William Beach, and to the right you find Lil Cove, with rock pools and cool rock formations. You need a tide-table to know the right time to be there, and we keep one in the house for guests, as well as a tide-clock on the exterior wall of the house, just next to the door on the patio. You might be able to guess we love the beach from how much we have gone on about it, but it is a truly special, one of a kind beach. If you want to explore the area a bit more, you have Boscastle a short drive away, which was infamously destroyed in 2004, but has come back better than ever, and wandering along there and seeing the fantastic architecture and out to the harbor is a great walk. We love the Boscastle Farm Shop, just up the hill from the town, for breakfast, and it has a stunning view over the Atlantic, and sells locally produced and grown food. Port Issac is a short drive away, and known for being the setting for TV’s Doc Martin show, but it offers so much more. Unique galleries, centuries old pubs, and an active fishing village are what you will find. With its tight little lanes, it is perfect for an afternoon out, and finishing up with a drink in one of the fine establishments, or a meal. You can also cycle the Camel Trail, and we can recommend several places that offer cycle hire. Or you can take the Black Tor ferry from Rock to Padstow, which is about 20 minutes to Rock, and enjoy all that Padstow has to offer, from small artisan shops like Jo Downs, to Rick Stein’s restaurants and patisserie. If golf is your thing, the course at St Endoc in Rock is award winning, and many places offer kite surfing, kayaking, coasteering, and more. If you are a foodie, we are blessed with some of the best world-class restaurants, from Nathan Outlaw’s 2 Michelin Star restaurant in Rock, Paul Ainsworth Number Six Michelin Star restaurant, and many many more – and we have yet to find a bad restaurant in Cornwall, Michelin starred or not! We’d be remiss if we didn’t mention Tintagel Castle, rumoured to be where King Arthur ruled, or the beautiful and unspoilt St Nectan’s Glen, both under a 5-minute drive away. The Glen is an Area of Outstanding Natural Beauty, and you can walk to the waterfall & hermitage through ancient woodland, which has also been appointed a Site of Special Scientific Interest (SSSI) due to the rate specimens of plants. After your walk, you can stop and have a spot of tea and a bit of cake at their café to prepare you for the (not very long) walk back out. Treknow and the surrounding area have something for everyone, whether your idea of a holiday is total relaxation, or filled with activity, and Puffins is the perfect base! We look forward to welcoming you soon.